It is poetic, although it was designed to be just practical. 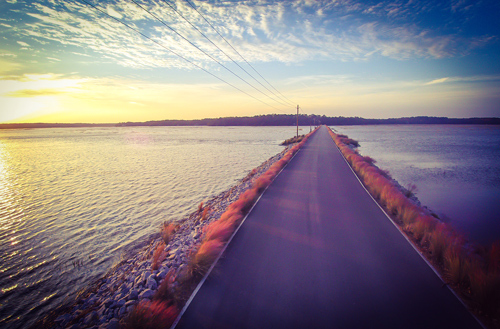 The causeway that connects Callawassie Island to the mainland turned out to be the very spot where so many people began to feel that Callawassie Island is the right place for them. And yet it’s not the causeway itself, but rather what it connects us with, that becomes such a strong part of our attachment to the island, to each other and to our neighbors ashore. The beauty of historic Beaufort and the magnetism of bustling Bluffton call us to our two nearest towns. They lie nearby, on our way to Charleston and Savannah respectively, and have so much charm and attraction and accommodation of their own that we head on farther, to the cities, only when we want to. The Beaufort Water Festival, in mid-July, celebrates several of our favorite things about our nearest town, Beaufort, SC. The scenic and historic Beaufort waterfront becomes the backdrop for art, cuisine and a few of our favorite community and charitable interests, too. 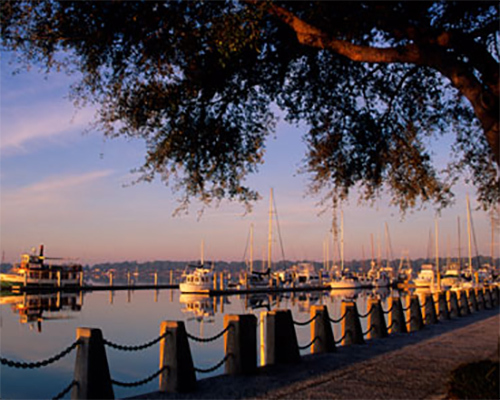 On any day of the year, a stroll along Henry C. Chambers Waterfront Park is a pleasure you’ll find nowhere else. The theme of this year’s 63RD Annual Beaufort Water Festival, “Salt Marshes and Bay Breezes”, barely begins to describe it. It’s not just the beauty that you see or the gentleness that you feel, but also the pace of everything that changes as you go across the bridge to Beaufort. 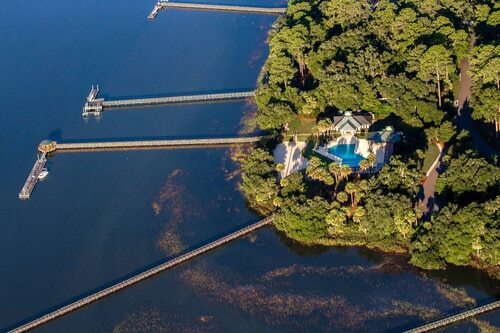 Longtime Beaufort resident Pat Conroy wrote, “I grew up slowly beside the tides and marshes . . .”. The rhythms he described here are as natural as the green coastline, the ever-changing response of the bay to the hours of the day, the warmth and passionate reds of the rising sun and the haunting glow of the Carolina moon. Against this backdrop, which has inspired artists and musicians of every style, as well as a beloved and poetic novelist, the Beaufort Water Festival orchestrates a drastic but temporary change for the 63nd time this year. Some towns think of quiet interludes. Beaufort lives more in the ongoing serenade of a quiet lifestyle with a lively interlude! Thousands gather at the Water Festival to dance and listen to musicians from near and far, to enjoy the fresh deliciousness of Beaufort’s local seafood, to peruse works of art and indeed to make their own style of enjoying the festival, a work of art in itself. Perhaps the event that spans the festival most conspicuously are the DragonBoat Races. The DragonBoat Races last year drew nearly 500 volunteer paddlers in 28 teams to raise funds supporting individuals and families affected by cancer. Several of those intrepid Dragonboat paddlers are Callawassie Island residents and Club members, whose efforts last year their raised $45,000! Though the waters here have never seen the ice, except for refreshments aboard a pleasure craft, or for cooling the day’s catch, DragonBoat Races are just the tip of the iceberg when it comes to the charitable interests our residents have among our Callawassie Island neighbors in neighboring communities. It is the fellowship and sense of community that forms an unseen purpose and pleasure people find when visiting a farmers’ market. Fresh, locally produced vegetables and fruit may be the centerpiece, but coffee, baked goods, arts and crafts and other attractions are often found at the same time. 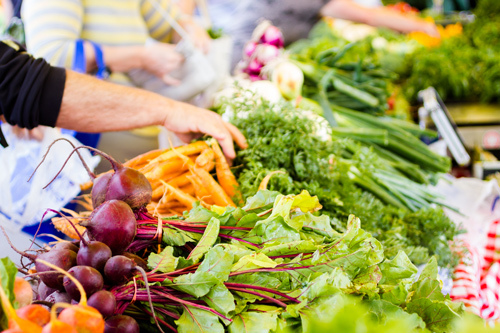 Altogether a farmers’ market can catch the vibe of a town at its best, when people are in a perusing state of mind, when ones gait turns with pleasure from a dash to a stroll. On Callawassie Island we’re surrounded by well-loved farmers’ markets in neighboring Port Royal, in Beaufort, and down the road in downtown Bluffton. All are blessed to count fresh seafood as a part of the local fare, and all share a welcome that harkens back to simpler, more serene times. Rain or shine, year-round, every Saturday from 9:00 a.m. to 12:00 p.m. you’ll see produce, seafood, eggs, fresh bread and cheese, local honey and barbecue – even beef – at the Port Royal Farmers Market, in Heritage Park near the Naval Hospital on Ribaut Road. Across the bridge, in historic Beaufort, it’s on Wednesdays from May to October that you can experience the downtown farmers’ market, at the corner of North and Bladen Streets, behind the Santa Elena Foundation. In nearby Bluffton, Thursday’s the day for the festive Bluffton Farmers Market, from 1 p.m. to dusk. 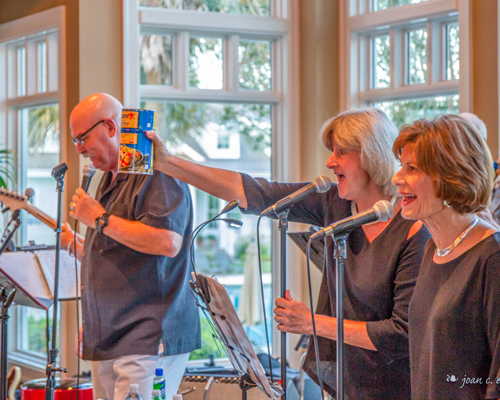 Live entertainment accompanies the fresh produce and festivities then on Calhoun Street in the heart of Old Town Bluffton. It’s an especially prime spot for framing a farmers’ market, because on any day of the week, and even without the booths and stands, there are artisan restaurants, and bars, and art galleries galore here. A fellow baby-boomer says that Calhoun Street reminds him of Sausalito in the late-1970’s, an artist colony that was just “discovered.” What better place to enjoy the feeling that makes a farmers’ market glow? 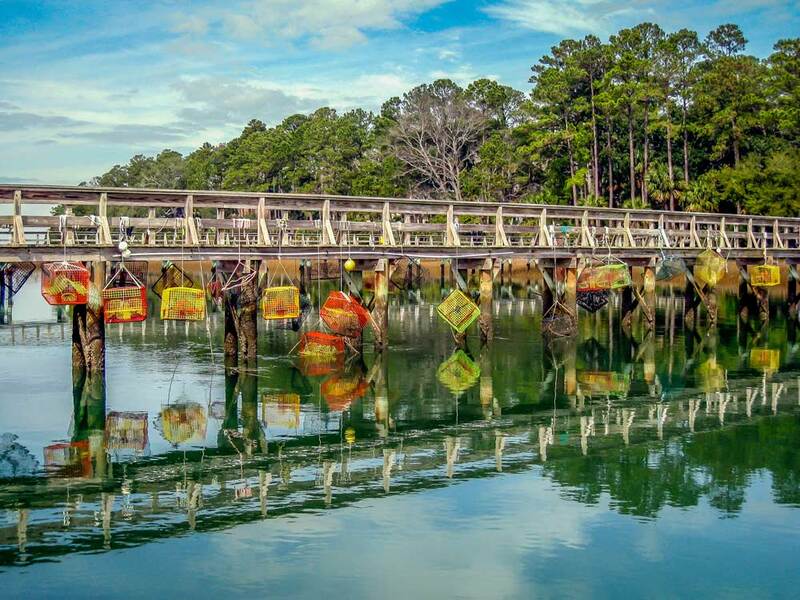 Speaking of Bluffton, the May River Shrimp Festival there takes place for one Thursday and Friday in July, in Oyster Factory Park, right on the tidal river that brought Bluffton to life in the first place. Since the Shrimp Festival often runs concurrently with part of the Beaufort Water Festival, it is an option to consider. Here you are part of the Bluffton Sunset Party Series, with all kinds of foods, and craft beers, including some that are locally-brewed. The park makes for a kid-friendly environment, there’s live local music, and Callawassie Island resident know that the whole thing is an insiders’ way to skip out on the crowd at the Water Festival in Beaufort. The Historic Bluffton Arts and Seafood Festival wait for October when the visitors and the weather both cool down a bit. It is a wonderful time for a historic walking tour, a delicious sampling of seafood and a “gallery crawl” down Calhoun Street. A special treat during the Festival, or any time, is to visit the pottery studio of Jacob Preston, “Bluffton’s Tallest Potter,” on Church Street just off Calhoun. Jacob is a true friend of all that’s good in the region, and he’s chatted generously with generations of Callawassie Island residents, even as he works his magic in clay and kiln. 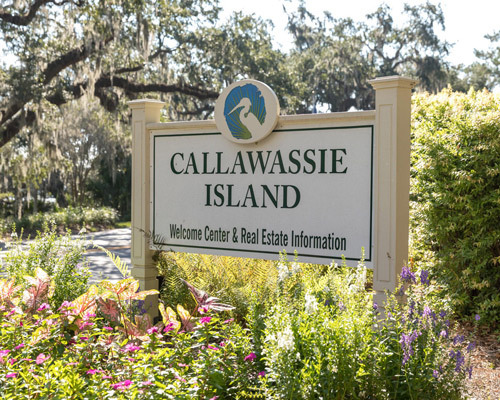 Thinking through these connections we have on, and off of our beloved Callawassie Island, we are reminded how blessed we are to be here in the center of them all. They’re easy occasions of enjoyment when we go to them, and they’re still rich sources of satisfaction, even when we choose our own tide-hugged island and stay home.